I used your review this year as my time to study was extremely limited during my current critical care fellowship. Your review was perfect, and I passed with no trouble. Thanks so much for the great product. I just took my recert a few days ago. I did an on-site review course that did nothing but scare me about things I didn't have to know - like triple acid-base disorders with Delta Gaps and in-depth pathophys all while costing me well over $1000. Luckily I had also signed up for your 10 year plan so I had already started reviewing "High Yield Emergency Medicine" and saved the lectures until the days before the exam. What a difference, besides being fairly priced (I would say cheap), the lectures were entertaining and seemed to fly by (unlike the class room setting). Most importantly you covered exactly what we need to know in a clear organized manner. I wish I had looked at the lectures sooner, I would have skipped the review course - I didn't realize that unlike the LLSA reviews I had unlimited access to the lectures. My advice to all who need to revert in the future is -1) Read the book, 2) do the ConcetPrep lectures when they are first available and as the test approaches, scan back through the book and review the highlights on the borders and look at pictures/tables, redo the lectures in the few days before your test and the day before do the review at the end of the book. You will do great (you will also do well just reading the book, watching the lectures and then the review just before the test)- I sat there almost laughing at the number of question topics that seemed right out of the lectures. I am telling everyone I know, this is the ONLY way to prepare for this test!!! You will save money (which you need to pay ABEM), have peace of mind and actually learn a few things along the way too. Unbelievable job guys! I want to thank you for providing an awesome and entertaining review. I used your ConcertPrep course and the book about a week before the exam. Your materials were dead on with the topics that you covered. I'm pretty certain that I would not have passed that exam without having used your preparation materials. I have recommended it to all of my colleagues. I took your course and studied from your text. Both were very good. I also attended a 60 hour course (I am very anxious about passing the exam). After taking the exam several days ago, I think I could have gotten by with just your online course and text, and saved myself time and money. I listened to the entire online course about 4 times. I hammered the final review chapter for 3 days prior to the exam. I really enjoyed your sense(s) of humor and candor. Very funny! I want to thank each of you for your service to our country. You are heroes. I thought the review text was detailed, but concise; it was an easy read. Well done! It covered probably all of the material on the exam! After 5 years of retirement and 1 year practice I did the Concert exam in 2 hours and scored 92 using only your course. Got the results in the mail two days ago and not only did I pass but I passed with a score of 94!!! Incredible! I have never scored that high before on a certifying examination. What a great course. Thanks very much for the course and the review book. What a great adjunct to study. Having completed the online course and having read the book, I passed my Concert! Thanks. They seemed to have used your book to ask the next question about the topics they test over. I only passed because of God's Grace and your excellent review course/book. Thanks. I am tired of playing the game of recert. I do really appreciate what Sudip and John have done as I have actually enjoyed the update. I've gone through all the material in the text and online once now and will repeat it at least one more time. I also feel akin to you guys as a veteran and like you have been doing this for a while. Thanks! You guys have done a great job with this. I have to say that compared to the MedChallanger, Concert prep is much better for the person who appreciates reviewing for such an exam but doesn't have the luxury of spending hundreds of hours! Ok, so I signed up for the concert prep course and bought the book as well. I have to say that the material was really of high quality and I wished I had it the first time around because it would have saved me a ton of time. I did the on line course 1.5 times and virtually none of the text book except for the high yield points at the end. The test itself was really nothing at all like the initial certification. I took 90 minutes to do the entire test and got an 83%. Perfect in my opinion. Your online review and textbook were the BEST. I read the book once and did the online review twice and passed the Concert. Well worth the price. Will recommend to the other docs at work. Thank you. Just got results from Concert 2011 exam. Passed with score of 88. Your book and online course was a great asset. John and Sudip you did a great job. I will keep in touch and utilize the LLSA Prep also. I just learned that I passed my second recertification (ConCert) examination and it was as a direct result of your course (both text and online). It was the best money I ever spent. Thank you. I scored a 87% with only 6 days of total study time. The text and online materials were excellent. I feel the materials were very applicable to the ABOEM recertification exam. Thanks! Excellent review. If I did not pass it will be my own fault. The text and lectures were right on the money and mostly painless. Thanks for the assistance. You have written a very good book. This book should be widely read....an incredibly efficient review for the ConCert exam! The content in your "High Yield Review" (final chapter of your review book) was very helpful for the actual exam! I passed the exam with an 88%. Would never have been able to do it without the important info on the website. There were no topics on the exam that were not covered in the course. I apprecate your assistance in helping me jump through this hoop. Scored an 86%. Minimal studying. Not difficult, but I couldn't have scored as well without your program. Thanks so much. I passed with score of 86; studied for just 7 days very infrequently and casually. On the whole your course is highly recommended for quicker preparation. The study material on the slide show was right on. You guys have really been able to condense the material to the test. Well worth the fee. Passed with a score of 94% with only 2 1/2 days of prep. Your review is THE BEST - appreciate it. Scored 90 on the exam - overall your prep course is comprehensive enough to do well on the exam...thanks. Excellent review. The real test was like some of your slides. I read part of a big board book but your review was much better for study purposes. I scored a 90 on my first attempt. Thank you! This is to inform you that I sat for the ConCert exam and I passed with a 94% score thanks to your very high yield web based prep. Thanks Docs! We studied ALL suggested written material AND your course for the ConCert exam and passed with very high scores (as usual my wife got higher scores than me). We probably would have comfortably passed it if we had just studied your course. Dear John and Sudip - THANK YOU!!! I passed with a 92, using only your materials for review. I think it's accurate to say you did a damn good job of preparing me for this exam. You were a life-saver! Sudip and John, the course was excellent. I passed my exam with just the high yield material with no other books to review.You guys covered all the topics that were on the exam. I would recommend it to everybody who plans to take the ConCert. Thanks a lot guys. I signed up for the course the week before the exam. The course was well worth the price. I did not use anything besides the online prep. If you can master this content on this review, you will do fine on the test. All the material covered is all that you need to do well on the actual exam (other than a few strange questions). I watched the online prep once. I just passed my ConCert exam with a 94 after using your review! Thanks! Your review is great - I just went through the lecture twice (once over the weekend) and was well prepared. I thought I needed at least 2 weeks until I found you guys. Passed with 92 - after only 4 days of serious browsing though your review. Thanks a lot - about 90% of questions were from your review. Thank you! Thank you! Thank you! After weeks of pouring over Tintinalli study guide, my mind was spinning with fact after fact after fact. My first attempts at practice exams one week prior to the exam were pretty dismal and I was in a panic. I found your site on google and after reviewing the comments from your customers I bit the bullet and purchased the course. I passed the exam with a 92!!! 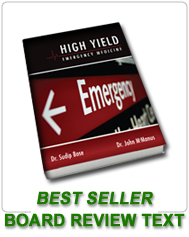 Your course narrowed down the mountains of information and allowed me to really focus on the high yield info! (Also loved the humor in the slides!!! Prior to your course I could have used a dose of the "Fukitol"). Thanks! The focus is perfect, the time commitment is minimal, and several of the actual exam questions appeared verbatim on the prep's review. In order to prepare, I watched the review course once and reviewed the draft copy of the textbook. Thanks for putting this together. You guys are definitely my heroes. I am going straight to Amazon.com to leave a review. The review itself was BRILLIANT! I started reading another review text and found it to be very dense with multiple trivial facts none of which appeared more relevant than the other. After an hour or so I was only 1/10 of the way through the material and really not retaining much because I could not tell what to focus on. This review is INCREDIBLE! I was blessed to come across your program 2 weeks before my exam. I'm please to report that I was able to ace the exam and for that I credit you for putting together such an effective tool. The audios were superb, I listened to it twice and easily passed. If you want to know how "high yield" your course is, well I studied for one week, went through the lecture twice. The result? I finished the exam in half the time and scored 90%. Thanks again! Great exam preparation. With two kids under 2 and working nights full time, I admit I couldn't make it through the lecture. However, I easily passed after making it through most of your material. You defnitely helped me answer MANY questions on the exam. Worth every penny! I felt very prepared. Thank you! I will definitely recommend you to others. I took your course over the last week and a half, and got a 94 on my exam. Uncanny how similar the test was to the study material. Great job with the website. Two passes through the lecture and I scored a 94. The exam was pretty much dead-on in terms of the questions asked. I just took my exam...now I know why you have a 100% pass rate. What an incredible focused review! Very pertinent information! I have passed my ConCert Exam with a score of 92. Thank you very much for your help during my preparation for the exam. My exam was littered with material from this review! The textbook chapters that were complete in 2009 were very pertinent. I highly recommend the book and online review and can't wait to see the book completed! It will be a great reference and teaching tool. Thanks guys! VERY VERY high yield! It's as if I could hear Dr. Bose's and Dr. McManus's voices during the exam! Awesome course. It helped me prepare in less than 2 weeks with quick revisions. Thank you so much for the LLSA and ConCert Exam review course. I just received my passing grade of 89!!! I was only able to go through the material once but the results were great. I was really stressed out with life issues and a new job (not ED) and you were just what the doctor ordered. Thank you so much Dr. McManus! So far, I am enjoying the review and I love the format. I love the "cut-to -the-chase" information style and the explanations where you get to the core of what you really need to know. I actually look forward to the review and I'm learning some new info as well. My only advice is for you to advertise fairly elaborately so that people get to know about your course. I just took my exam recently and passed with a 90 after only studying for a few days using your awesome prep course. Thanks a lot! I think the course covers the material really well. Just wanted to tell you that your course worked like a charm. I was really pressed for time and only had a couple of weeks to prep. I used NO other prep materials and scored an 86%. Kudos to you guys ...your course is spot on!! Many questions on my actual ConCert exam were covered by your review. Good job guys. Please tell your LLSAPrep customers to do this review. The material is similar to the questions on the exam. I only prepared with this course and did very well. I was only able to go through the material once but the results were great. The textbook chapters that were complete in 2009 were very pertinent. This course is just what the doctor ordered. Thank you so much for the LLSA and ConCert Exam review course. I just received my passing grade of 89!!! I actually look forward to the review and I'm learning some new info as well. I love the 'cut-to -the-chase' information style and the explanations. I am enjoying the review and I love the format. Keep updated on your ABEM requirements by liking us on Facebook! "They seemed to have used your book to ask the next question about the topics they test over. I only passed because of God's Grace and your excellent review course/book. Thanks."